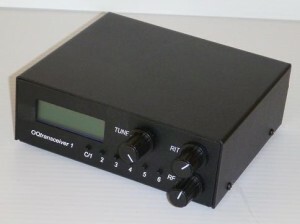 The OpenQRP 40m CW Transceiver kit is now available for delivery to the USA and Canada from OpenQRP.com (USA) at $150.00 plus $10.00 shipping (USD). This provides around 6 to 8 Watts output at 13.5 V on 7 MHz. It includes an LCD display, CW decoder, memory keyer, and has 400 Hz IF selectivity. The processor is based on Arduino technology, allowing experimentation with the firmware. It is designed by Steve Elliott, K1EL, well known for his WinKeyer family of keyers. This entry was posted in Announcements, Kits, News, Product Announcements, QRP Radios and tagged Kits, New Products, OpenQRP, OpenQRP Transceiver. Bookmark the permalink.